Hang a hammock, bring home construction supplies or strap down a fleet of boats. 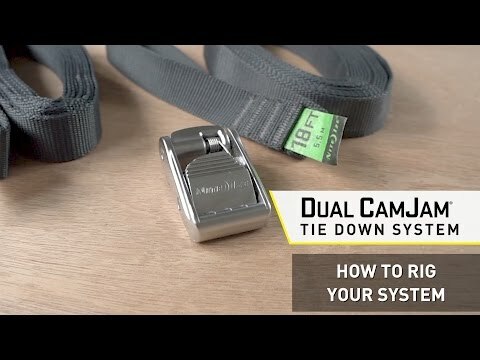 This tie down system has 2 cam locking mechanisms, one on each end. 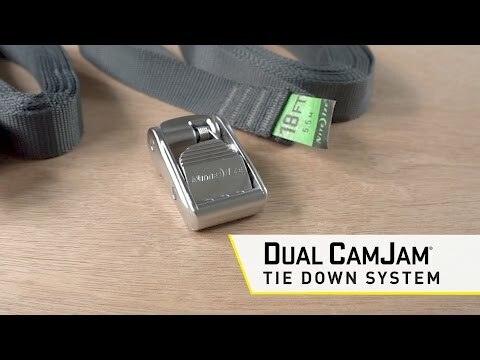 Slide cam 1 onto the webbing, adjust the buckle placement, then complete your configuration by wrapping the strap around your load and inserting the webbing end through cam 2 for tensioning. This setup uses half as much webbing as traditional tie down straps and you get a 3-to-1 mechanical advantage to really secure your stuff. Tensioning mechanism is made of premium die-cast zinc alloy with a nickel plated finish. Includes 18 feet of high density 1-inch polypropylene webbing with an integrated bar tacked loop at one end. Working load limit is 400lbs, breaking strength is 1200lbs.